Waldo Rochow, MBA: What is Ethical Debt? 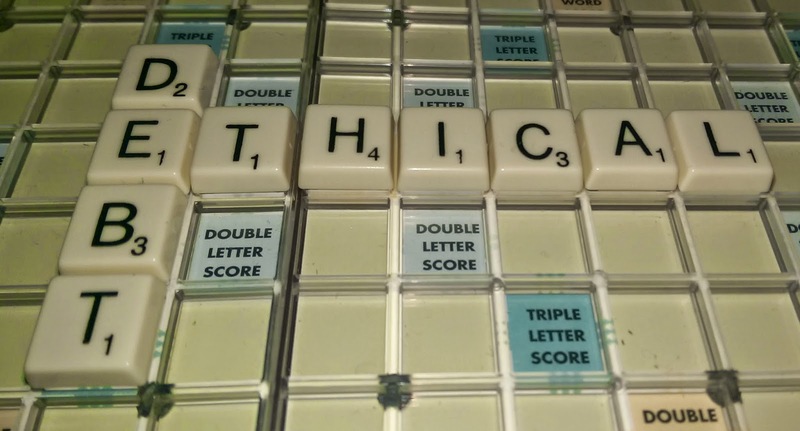 are questions of ethics still valid? -- Jean-Baptiste Alphonse Karr, Les Guêpes, January 1849. Each generation thinks that the next generation is wild and reckless. My grandparents were likely taken aback by the introduction of Rock and Roll to modern society. They would certainly have preferred the works of J.S. Bach. However, if I'm not mistaken (and I might be) J.S. Bach was branded a heretic in his day! Now there is obviously a huge difference between socially acceptable music and ethics. I suspect however, that societal ethics don't actually change as much as we might think. If one considers the Occupy Wall Street movement that started a few years ago, the protesters were against corporate greed at the expense of the less fortunate. Basically, as the theory goes, 1% of the population is living off the backs of the other 99%. Now I don't entirely buy that, however the point of Ethical Debt is that, as far as most people are concerned, this could be true. Ethical Debt must be managed in the same way as financial debt. The impact of financial debt is obvious. We can only continue incurring more financial debt for so long before our creditors pull their purse strings tight, and refuse to offer any more. There may be situations where debt must be incurred, however the longer that debt stays on the books, the more expensive it is to remove it from the books. Many readers may at this point think I am referring to the mystical concept of Karma. This would be a misunderstanding. Karma implies that when you do good, at some time in the future, in some unrelated fashion, good will be done to you. The opposite side of Karma holds that when you do evil, evil will be done to you. Ethical debt on the other hand, says that when you stretch the boundaries of socially acceptable behaviour, society is less and less likely to trust you. To illustrate this, let's take a look at Bill Gates. With respect, Bill Gates is renown as an aggressive businessman. He has caught the ire of many around the world for what outwardly appeared to be a profit at all costs approach to his leadership at Microsoft. Since stepping down from an active role at Microsoft, Mr. Gates and his wife have started the Bill and Melinda Gates Foundation. Since its inception, the Gates Foundation has given away nearly $33 Billion, yet Mr. Gates continues to be portrayed in social media as some sort of evil mastermind. How many more billions of dollars will the Gates family have to give away before the Ethical Debt is off the books? Another illustration is the assassination of Boris Nemtsov on February 27, 2015. Is there anything that Russian President Vladimir Putin could say or do to make the world believe that he was not involved? The fact is that what Mr. Putin does speaks so loudly that nobody can hear what he says. The opposite side of Ethical Debt (ie: Ethical Credit) is also true. George Washington is attributed with the quote: "It's better to be alone than to be in bad company." Of course, there is no way to validate that this was ever uttered by Washington, or that he is its original source, but his reputation is such that we believe it to be true. The story points out that "Canada saw the largest drop in trust in business of any of the 27 countries surveyed." What this tells me is that Canadian companies are trading internationally on the reputation of our citizens. The rest of the world trusts Canadian businesses almost implicitly, but the people who know us best (those within our borders) don't trust us like they used to. This is a wake-up call to all businesses. Correct your Ethical Debt before you have no reputation left upon which to trade.